Soon she finds the love of her life. For eight years, Sam Cawley, a warm and kind man, treats her like a queen - filling her days and nights with laughter and affection while providing a caring refuge from the daily suffering and death she battles as an emergency physician. What should an intelligent, accomplished, self-respecting woman do? 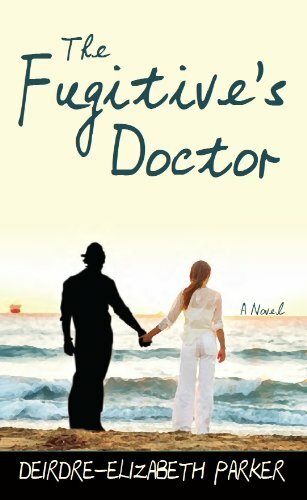 The Fugitive’s Doctor, a novel by Deirdre-Elizabeth Parker, reveals a surprising, provocative, and ultimately poignant answer. Instead of racing home, dumping all her husband’s belongings on the driveway, and running over them in her Mountaineer, she declares her unwavering commitment to the man who has been living a lie. Far from withdrawing in anger and bitterness as the “victim” the authorities label her, she becomes her husband’s most powerful ally in navigating a tangled web of legal nightmares, secrecy, family betrayal, and emotional and financial upheaval. For two years, she leads an excruciating campaign for reasonable sentencing terms that might bring her husband back home to her before time and ill health take his life prison. Her vow to stand by her man never wavers. Why would the former Chair of a hospital Emergency Department and Associate Dean of Medicine at a University Medical School choose a course that many women would consider foolish or destructive - an act of relinquishing personal integrity and self-esteem? Why would she cling to a marriage sustained only behind prison walls? Doretha (Doe) reveals her answers with a startling openness, honesty, and passion that challenge all our assumptions, beliefs, and judgments. As she chronicles her personal crisis and shares her innermost feelings, Doe makes the case that what she is doing is what we all should be doing. Practicing unconditional love, not with blinders but with compassion, caring, and an awareness of the big picture. Helping one another heal from deep, painful wounds. Recognizing our own roles in the troubles that others appear to bring us. Honoring and finally celebrating the metamorphosis that can come when we choose what is right even when others are absolutely sure it is wrong. Amid the heartache and many defeats she finds joys and triumph. She helps open a door for William to reunite with his family that had long ago disowned him. She comes to appreciate the human frailties and vulnerability of a culture of prisoners and the loved ones who wrestle with systematic biases to stay connected. She welcomes the irony of greater love pouring through after an earthquake strikes. And she is stirred not only by her own growth but by the profound changes she sees in her husband. The honest, no frills style of writing employed by Deidre-Elizabeth Parker allows her audience to truly experience the raw emotionality of this thought provoking read. Readers will find themselves swept way by this story of a woman who found a most perfect love with a most flawed man. In a world where "I love you" is just 'that thing we say,' we find in Dorthea Vaughn, a woman who is willing to put it all on the line for her L-word. Sam Cawley, a.k.a. William Wallace, stands as proof that Prince Charming sometimes wears tarnished armor. Though it may be easy to vilify him at first glance; upon further inspection we find a man doing all he can to banish the demons of his past and hold on to the angel in his present. This book also serves as a testament to the good and evil of the American justice system and the trials and tribulations endured by both the incarcerated and the families that they leave on the "outside". This story will serve as notice to even the most jaded soul that with "unconditional love" there is no price that is too high except that of it's loss. "WTF Did You Just Say? Notable Quotables from "The Fugitive's Doctor"
I would like to personally thank Deirdre-Elizabeth Parker for the privilege of reviewing her work. I am greatly impressed by the care, respect, and attention to detail with which she approached the sensitive subject matter of her work. It is my deepest hope that the "light of hope" that illuminates this novel serves as the candle that lights the path of many hearts.